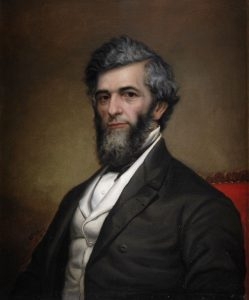 Fentonville native Reuben E. Fenton an NY Congressman and two-term Governor was known as the "Soldiers Friend". Fenton's first act as a US Congressman was to introduce a bill to grant relief to surviving invalids of the Revolution and War of 1812. His strong interest in the welfare of the American soldier would dominate his political career as the nation moved to the Civil War. 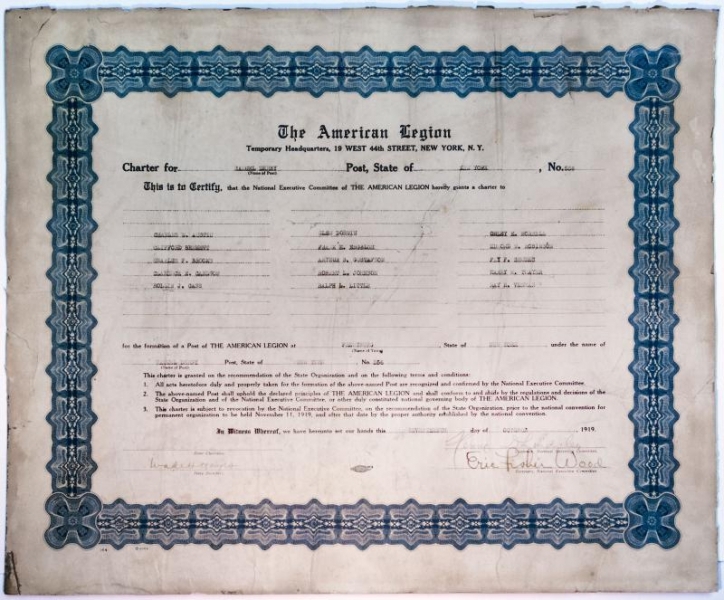 The New York Soldiers’ Aid..
As the American Legion was being formed in the early 1920's another Veterans group was declining in memberships. The Grand Army of the Republic GAR had been created. 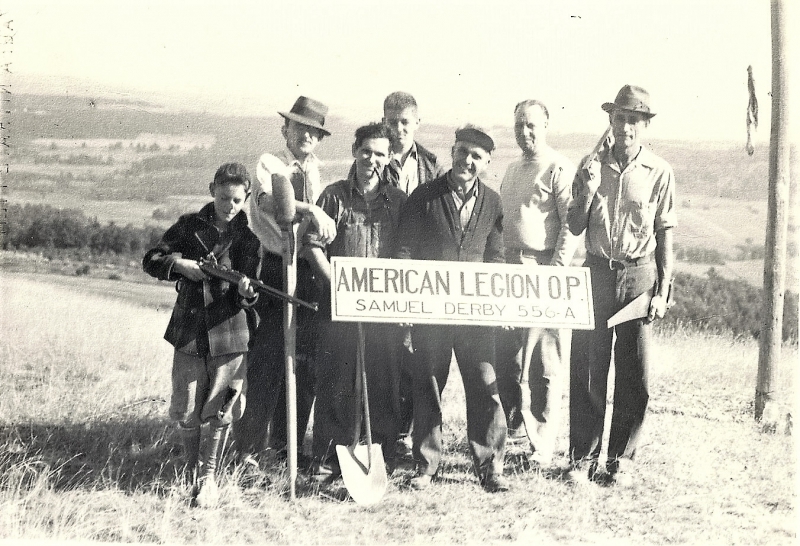 Like the American Legion had set up districts and local chapters. Linking men through their experience of the war, the G.A.R. became among the first organized advocacy groups in American politics, supporting voting rights for black veterans, promoting patriotic education, helping to make.. This video is out of Utube, Buyout Footage.com. This is a free public domain video, It is of good quality depicts a soldiers life in the Battle of Argonne. Travel by marching, trench life and moving heavy artillery shells. The video lasts about 10 min. and has no sound. To play a video you must touch on "Full story" and the video should start automatically. To return to the history touch "View more history..
,Returning from the Army camps in America and Overseas following World War I, American Veterans, desiring to perpetuate their comradship, organized Posts of the American Legion in their home communities. In most cases these Posts were named in honor ot the the first boy from the community to fall in battle. 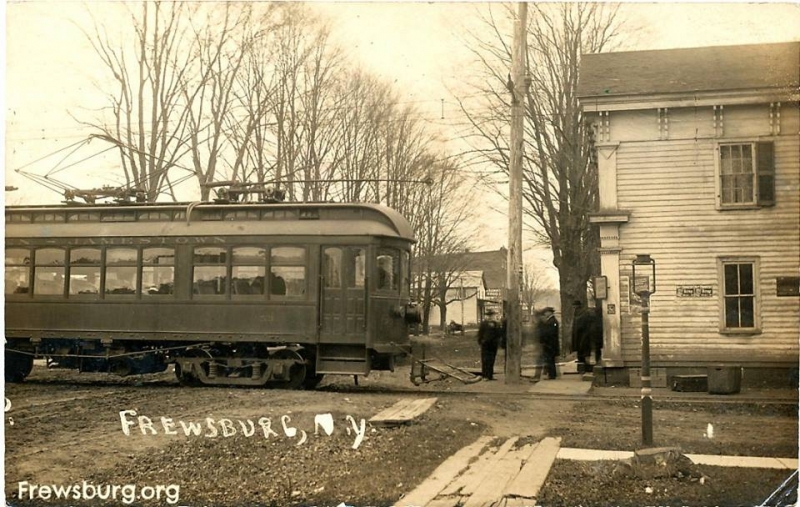 The village of Frewsburg, New York was no exception to this rule. The Post is known as Samulel Derby Post No. 556 and named..
American Legion charters Frewsburg Post 556. 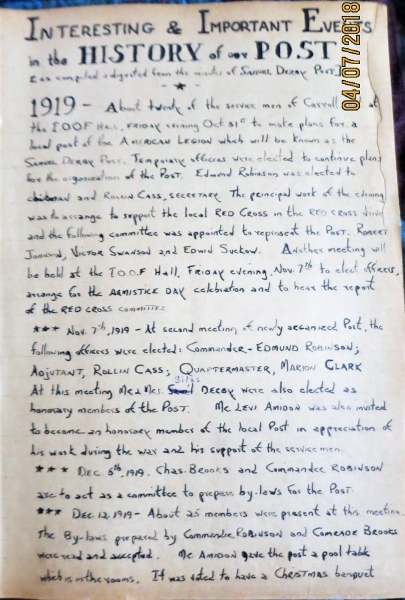 1919 – About twenty of the service men of Carroll met at the I.O.O.F Hall Friday evening Oct. 31st to make plans for a local post of the American Legion which will be known as Samuel Derby Post. Edmund Robinson was elected to chairman and Rowan Cass, secretary. The principal work of the evening was to arrange to support the local..
Samuel L. Derby Post 556 members from 1919 first took turns using members homes for a night for their meetings. This short-term problem was solved when they put together enough money to rent rooms for their meetings in the rear of the Venman Building Main St. Frewsburg. The rent for the rooms came to $6.00 per month, and they stayed at this location for about five years. During early 1920's members attending the meetings averaged.. 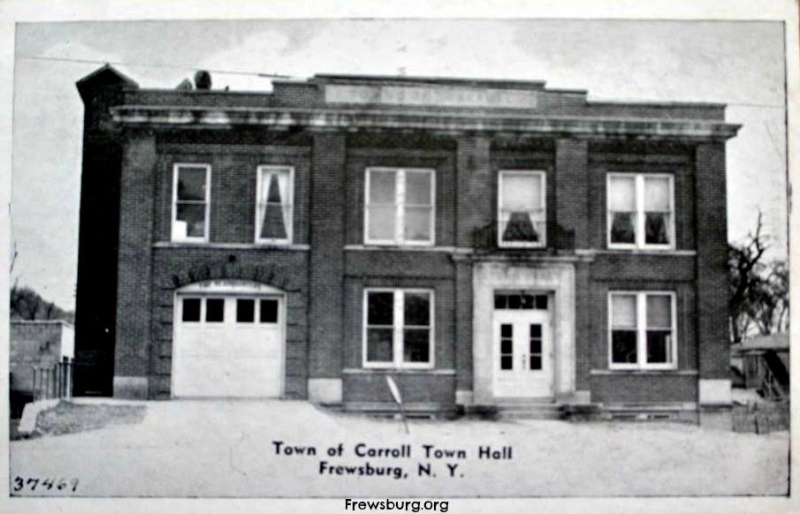 The Post moved to the Town Hall in the spring of 1925. 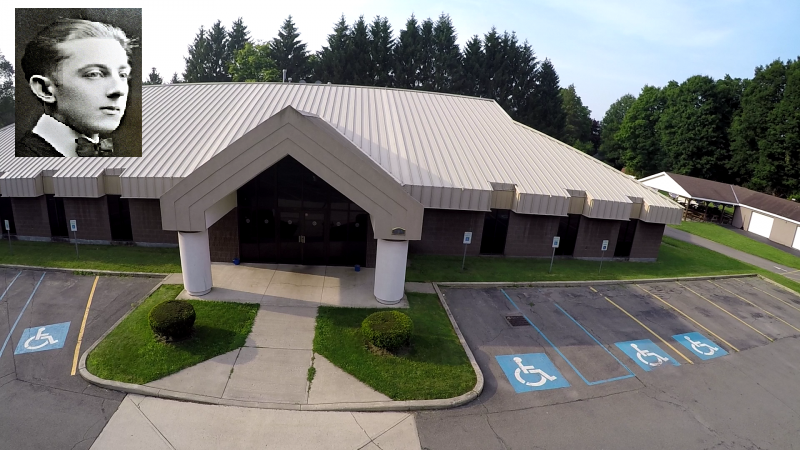 They had a yearly lease with the town that was renewed each year for ten years. At that point, the Town had grown, and they needed the room. The Post moved across the street to the bowling alley, then known as Kyle & Little. This move lasted about three years until they moved back to the Town Hall and used the Fireman's rooms. Travel in the early 1920's was difficult. Rollin Case told of going to a County Meeting in Silver Creek or Ripley, and many other places were quite an experience. At that time Rollin lived on the old Cass farm at the "Y" on the Ivory-Kennedy Road. 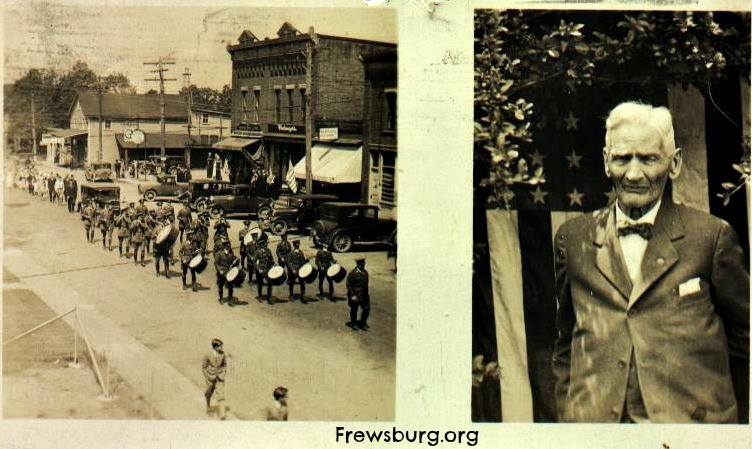 To be at a meeting at 8:00PM in Silver Creek, he would leave home around 4:30 in the afternoon, ride a horse to Frewsburg, tie it up in the..
Frewsburg Auxiliary Unit 556 formed. 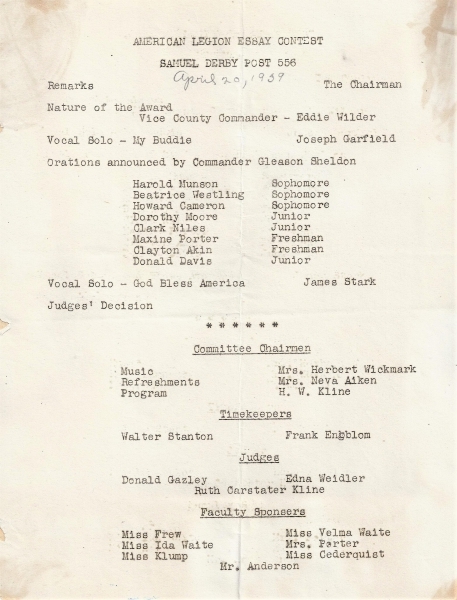 As early as April 6 1920 Post meeting there was some discussion regarding the formation of an Auxiliary and it was voted to have a Social evening, Friday, and on April 23rd and to invite ladies with the view of starting a ladies Auxiliary. It was voted by the members that the Post secure additional rooms providing the cost was not too high. The Post voted to take over decorating the G.A.R. 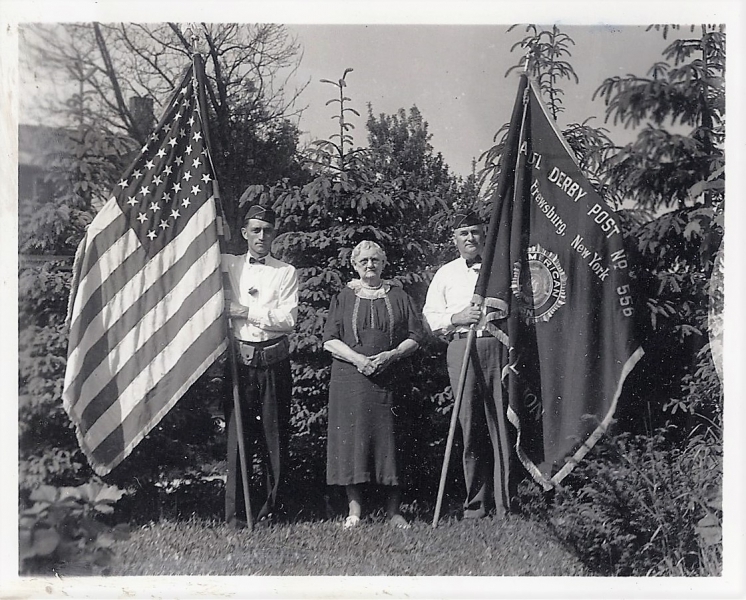 Graves if the..
An important photo of the Post's history left to right; Walter Stanton Mrs. Celia Derby and Joseph Fox at a Memorial service in Maple Grove Cemetery. 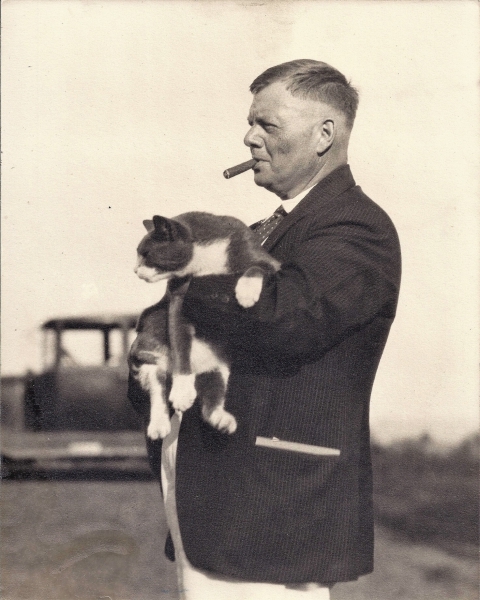 This photo was used for many Post publications during the 20s and through the 1940's. 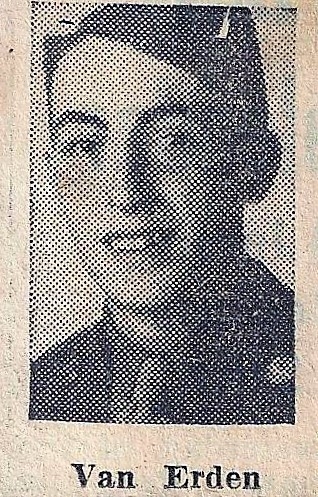 In April 1941 at the request of the members of Samuel Derby Post, the April 1941 issue of the Chautauqua County Legionnaire was dedicated to Mrs. Derby, Gold Star Mother, whose 87th..
Harry Laughlin was affectionally known as "the Skipper", Harry was the devoted Service Officer of the American Legion in Chautauqua County. Fighting for the legitimate claims of all servicemen in our area. In our behalf, he wore out his car and unanimously awarded a new car by the grateful Veterans of the County. 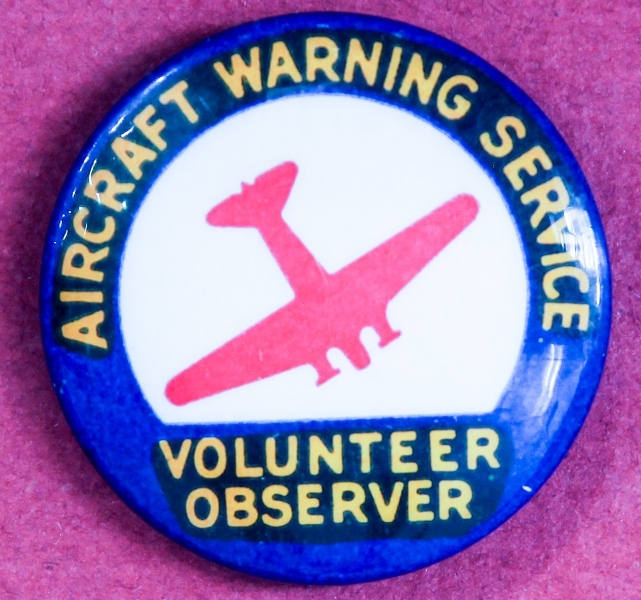 Volunteer aircraft observers of the Aircraft Warning Service wore these small lapel pins. During WWII, the east and west coasts of the United States were protected by civilian volunteer aircraft spotters, members of the Ground Observer Corps. The GOC was a component of the Aircraft Warning Service (AWS) that was established in May 1941 in response to the development of heavy bomber aircraft capable of flying over 1,000 miles. Almost one million men and women–volunteer “soldiers out of..
A wooden tower was built by members of Post 556 and Boy Scouts to be used by spotters for enemy aircraft during the early years of WW II. The elevation at the "old Swanson farm", what is now Erlanson Park was an ideal location. Spotters were trained how to identify enemy aircraft. The photo indicates that a rabbit or two were also spotted. young Bill Stanton holding the rifle (then 15 yrs old), Harry Kline, young..
Fire Controlman 3rd Class Lester Theodore Eklund was declared “Missing In Action” off the coast of the Indonesia Nov 1943. His submarine, the U.S.S. Capelin (SS-289) was probably sunk by Japanese mines or depth charges. He lived on Wheeler Hill Rd., Frewsburg, son of Mr. & Mrs Albert R. Eklund and had a younger brother Burton. He is a Hero and lost his life along with..
Sherrill A. Anderson son of Raymond and Jessie Anderson Falconer NY. had written his last letter home in mid October. The letter was received Nov 4th. He was Killed In Action Oct 23rd 1944 during the battle of Leyte Island - the Philippines. Pvt. 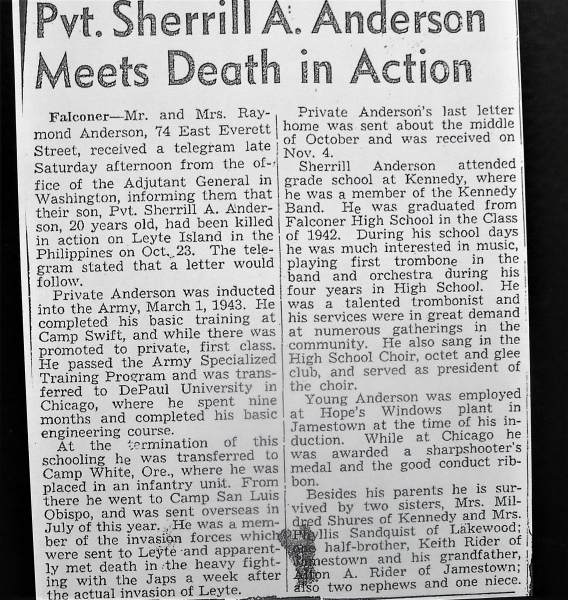 Anderson was a member of 383rd Infantry 96th Division. Sherrill had graduated from Falconer High School 1942. 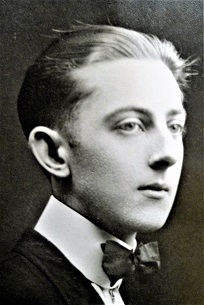 He was very interested in music playing in..
Herbert L. Van Erden, son of Mrs. Gertrude LeBar Button and the late John Van Erden. Born Jan 6, 1922 in Sheridan, NY. He attended Frewsburg High School. 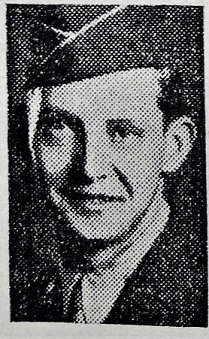 Later he worked for the Chautauqua County Highway Department in Falconer before his enlistment. Besides his mother, he left behind two brothers: Kenneth Van Erden,( a Sgt. stationed in England at the time of Herber's death) and Donald also a brother listed as an Arthur Button. 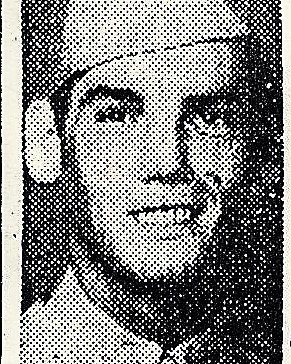 Pfc..
Pfc Edward Shures son of Eugene and Florence Hale Shures was Killed In Action while fighting in the Battle of Luzon Philippines Feb 3, 1945,. The Battle of Luzon was one of the bloodiest of the Pacific. Pfc Shures was 28 years old and a member of the 27th Infantry Regiment, 25th Infantry Division he was awarded the Purple Heart with Oakleaf Cluster. Buried at: Manila American Cemetery Location: Fort Bonifacio, Manila, Philippines-Plot: F Row:..